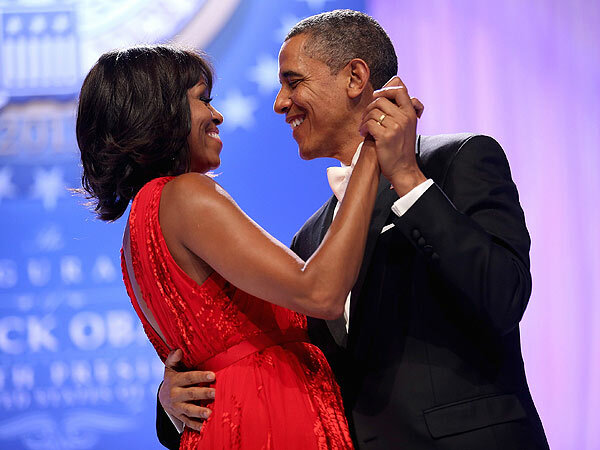 President Barack Obama celebrated his second inauguration Monday night with a private party following his very public day. The Obama family – including wife Michelle and daughters Malia and Sasha – headed to the White House later on in the evening for a black tie affair, which included celebrities and political stars, as well as a late night buffet of desserts. The Obamas were surrounded by 300 family and friends, including Bill Clinton (without his wife Secretary of State Hillary Clinton), John Kerry and Colin Powell. Lucky celebs who landed an invite were Swizz Beatz and wife Alicia Keys – who shared her inauguration photos with PEOPLE – Usher, John Legend and fiancée Chrissy Teigen, Jennifer Hudson, Katy Perry and John Mayer (who were "quite cute," says a source), Kelly Clarkson and her fiancé Brandon Blackstock, Eva Longoria, Kerry Washington and country star Brad Paisley. Not in attendance: Jay-Z and Beyoncé, who according to a source, flew straight to New Orleans, presumably for Super Bowl rehearsals after their inaugural duties. "The whole family stayed until the end, about 2 a.m.," says a guest.